Months after the events took place, Pulitzer prize winning journalists and others are finally reporting about the lies and manipulations of the US government regarding the recent chemical weapons attack in Syria. Far from shining a light on the true situation in the country, however, these reports continue to avoid the underlying causes and explanations for what is happening in Syria, and the forces that are behind it. This is the GRTV Backgrounder on Global Research TV. This disdain for the public and the psychopathic ease with which elected officials lie to their electorate is nowhere more apparent than when a democracy attempts to rally its citizens to support a war of aggression abroad. If truth is the first casualty of war, the battlefield where that casualty takes place is in the mind of the liars’ own citizenry. Sadly, recent events have provided no shortage of examples of this phenomenon. In the early days of the Iraq War, media analyst Andrew Tyndall examined 414 news stories aired by ABC, CBS, and NBC about the build up to the war, finding that 380 of them, a staggering 92%, sourced back to one of three U.S. government agencies: the White House, the State Department and the Pentagon. A further study found that of 574 stories aired between Bush’s speech to the UN in September 2002 and the beginning of the Iraq war in March 2003, only 12 stories, just 2%, dealt with the possible aftermath of the invasion. Perhaps unsurprisingly, a remarkably similar pattern has played out in the years-long propaganda campaign to convince the American, British and Western public in general of the need for armed intervention in Syria. A September 2013 study from Pew Research found that in the wake of the chemical weapons attack in Ghouta in August, the coverage of the Syrian war debate on cable news networks from supposedly different viewpoints was almost identical. The study found that Al Jazeera America, CNN, and BBC America all framed their reports in substantially similar ways and relied on substantially similar sources, including by far their most common three sources: the White House, the congress, and the military. A further study in October of this year by the Public Accountability Initiative found that many of the so-called Syria “experts” relied on by the western media to provide commentary on the Syrian conflict had direct financial ties to the defense industry, exactly as had been previously exposed in coverage of the Iraq war. None of this is surprising to those who have been following the media coverage of the Syrian conflict from the beginning. Indeed, alternative media pundits have been pointing out the obviously biased coverage of the conflict since its very inception. 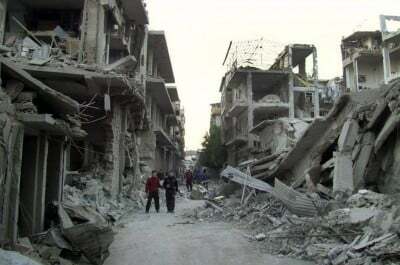 The beginning of the campaign to frame public opinion on Syria can be traced back at least as far as 2006, when the Bush administration first approved US government funding and training for opposition forces in the country, but began in earnest after the conflict broke out in 2011. From the early days of the Syrian conflict, Western media outlets including CNN relied on dubious activist Danny Dayem, known as “Syria Danny,” for coverage on the ground in the war-torn country. However, after Syria Danny was exposed staging his reports, Anderson Cooper invited him on his program, not to explain why he was staging fictitious reports, but how the evidence of that fakery made its way onto the internet. In March 2012, several key staff from Al Jazeera’s Beirut bureau, including the bureau’s managing director, a correspondent and a producer, all resigned in protest of the network’s bias in its coverage of the Syria conflict. In August of 2012, the BBC released a video report showing members of the Syrian terrorist insurgency planning to trick a prisoner into becoming an unwitting suicide bomber, a war crime under the Geneva Conventions. After independent media started to draw attention to the clip, it was quickly removed from the BBC website and copyright violations were posted on YouTube copies of the footage. And in the wake of the recent Syrian chemical weapons attack, the BBC aired an interview with a dubious medical expert that appeared to have had its soundtrack drastically altered in two different versions of the interview broadcast in separate reports. As Michel Chossudovsky, director of The Centre for Research on Globalization in Montreal, points out, however, as egregious as these manipulations are, even the more “balanced” critiques such as Seymour Hersh’s recent reporting on the US government’s manipulation of its intelligence over the chemical weapons attack in Ghouta, still exclude the key information which would help the public understand what is really happening in Syria. Perhaps the most remarkable thing about the Syrian war coverage of the mainstream media is not its underlying bias—that was always to be expected—but how remarkably ineffective that coverage has been in convincing the public of the need for military intervention in the country. After nearly three years of relentless propaganda attempting to convince the public of the virtue of the terrorist insurgency and the incomparable evil of Assad, the seemingly inevitable march toward war in the wake of the Ghouta chemical weapons attack faltered after public opinion overwhelmingly came down on the side of non-interventionist policies. Perhaps reading public sentiment, many mainstream outlets even took to pointing out the media bias on the war and trying to retroactively position themselves against military intervention. This has to be credited to a remarkable, global, grassroots phenomenon of independent citizen media breaking through the layers of propaganda to provide true, cogent analysis of the situation on the ground in Syria. In the face of generations swayed by the mass media manipulation of Ivy Lee and his ideological progeny, this alternative media movement is setting the foundation for an alternative paradigm in which Lee’s cynical rhetorical question “What is a fact?” has a very different answer than that which the ruling classes would want us to believe.